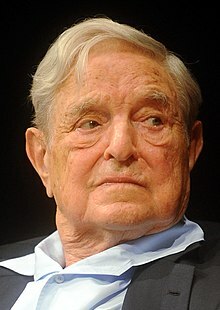 ^ Forbes 400 Richest Americans: George Soros. Forbes. September 2011 [October 6, 2011]. ^ George Soros. Forbes. [2018-09-17]. ^ "David Brancaccio interviews George Soros". Now. PBS. September 12, 2003. Retrieved February 8, 2007. Laura Blumenfeld, Billionaire Soros Takes On Bush, MSNBC, November 11, 2003. CLN financier Soros attacked with glue in Ukraine，UCCTruths.com, April 4, 2004. George Soros, The Bubble of American Supremacy, column in the Atlantic Monthly, December 2003.